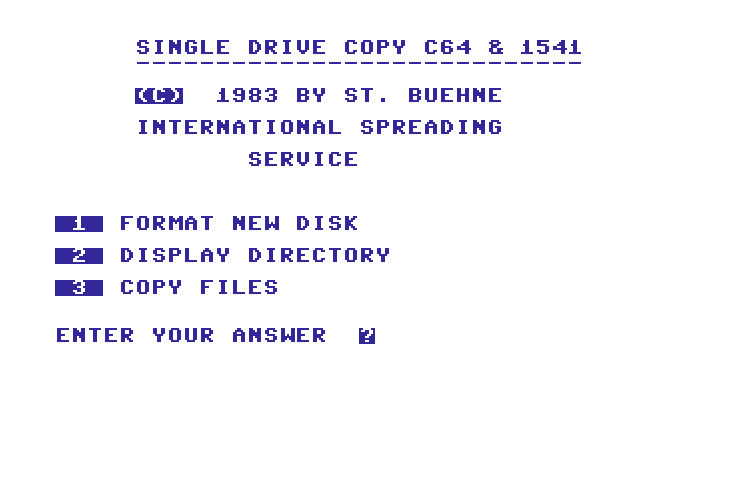 1571 Single Drive File Copy is a Commodore 64 program that has the ability to copy files from both sides of a floppy. 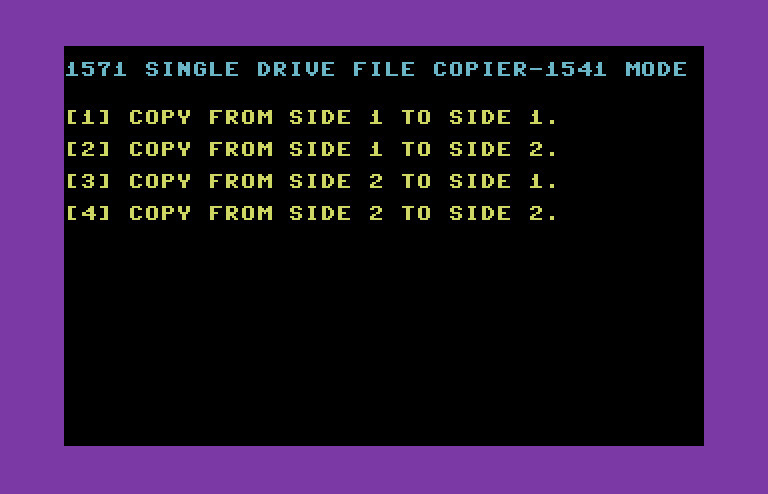 1581 File Copy is a super simple file copier. Supposedly is supports dual drives but I only had a single drive to test with and it supports swapping disks for file copies. Based on LM Backup by Luke Mester, this version is for the 1581 drive. The interesting thing about this file copier is that it will let you copy files between partitions on the same drive with a 56k buffer. 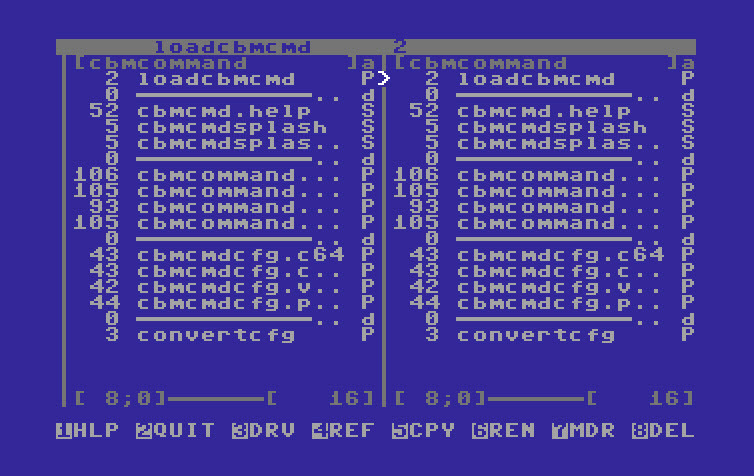 Note that line 2 of the program has the default drive set to 9, so you may need to edit it if you have a single 1581 setup as drive 8. This is a nice little file copier that will work with a single drive and can store as much as 58k in memory per pass. 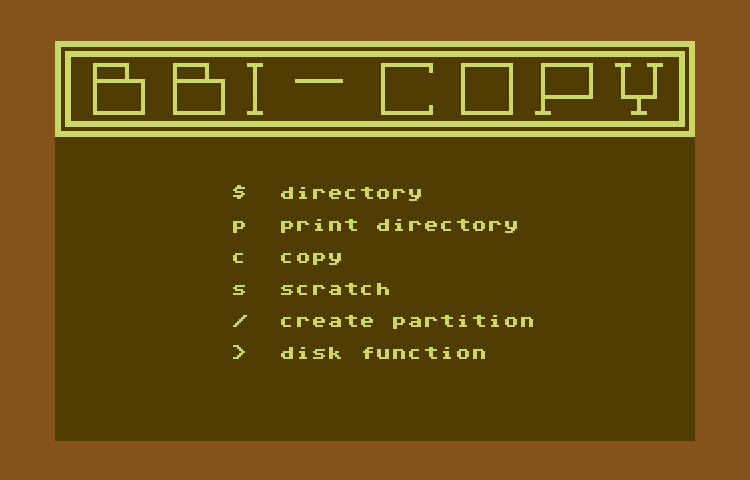 BBI Copy is a two drive only copier designed for the 1581 drive but will also support other drives. Built-in support for creating partitions for the 1581. 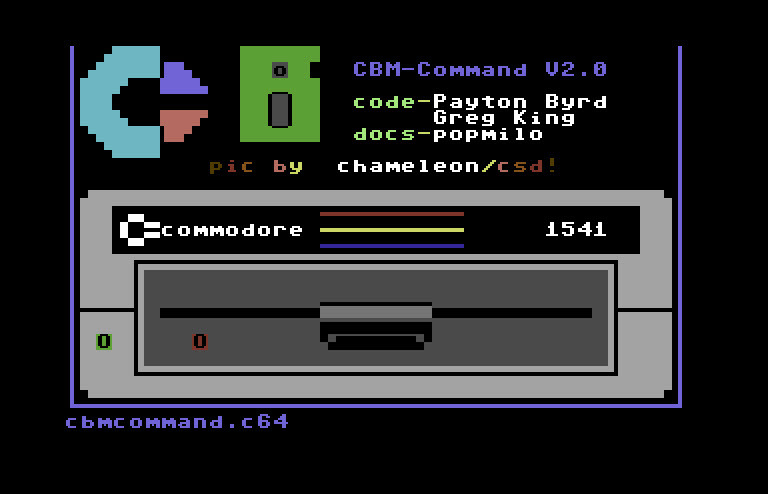 CBM Command is quite possibly the best ever file copier made for the C64/128. CBM Command is much much more than just a file copier. It can make and extract .d64 and .d81 images and read sequential files. NOTE: Although the intro screen says v2.2, this is v2.3 as it defaults to a horizontal split screen and all earlier version had vertical split screens. Written by U. Stahl (Turbodisk by Jag). 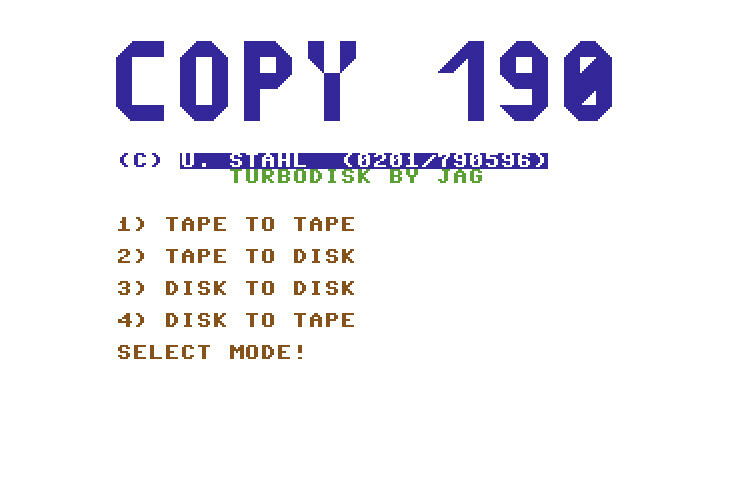 Copy 190 is a file copier that can copy from tape to tape, tape to disk, disk to disk or disk to tape. Files up to 190 blocks in size can be copied. 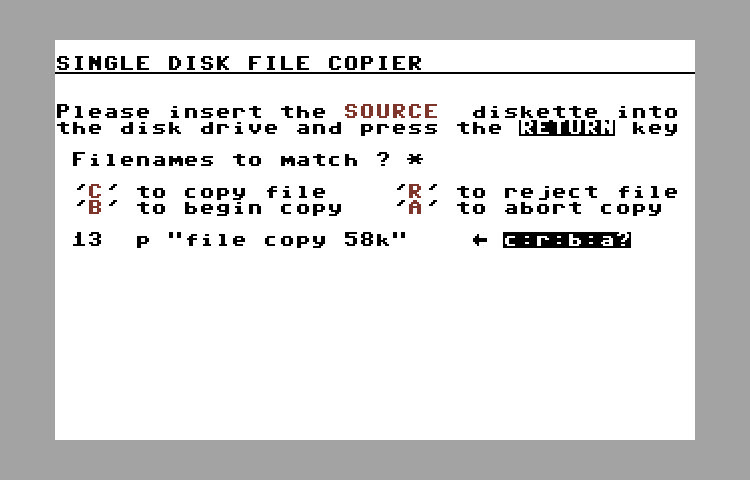 This program also incorporates a turbo disk routine to make copying bearable. Another great file copier by Jim Butterfield. This copier requires two drives, but it can copy everything including relative files. 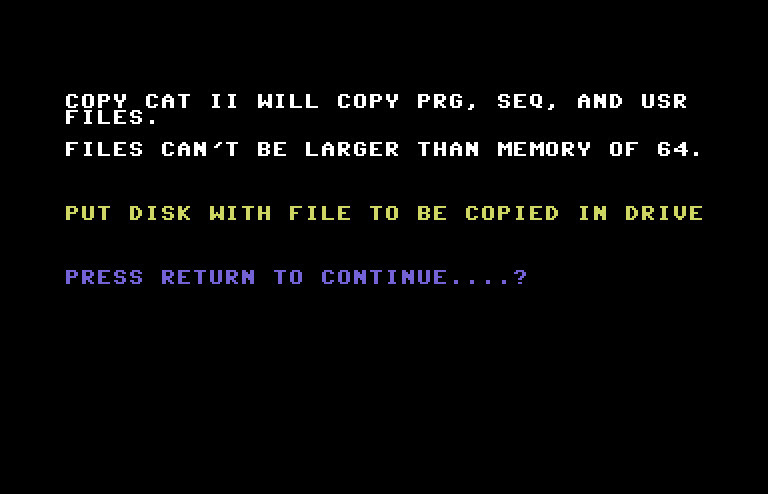 Copy Cat II is a file copier that can copy among other things USR files. Only files that will fit in memory can be copied. 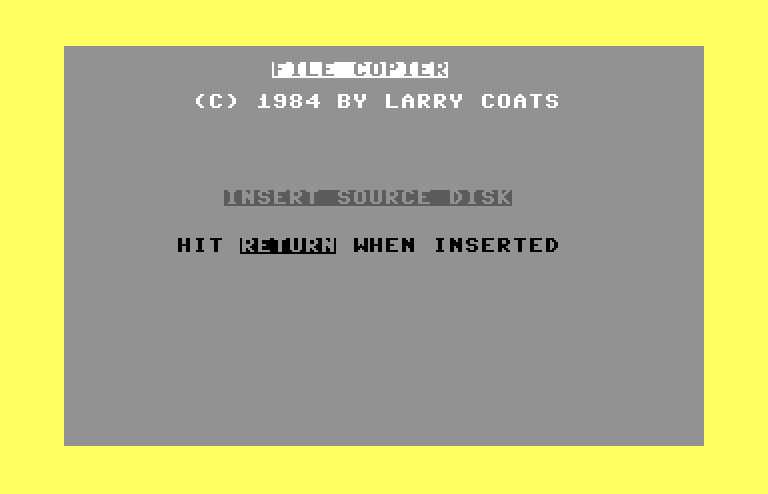 Written by Paul Kellam, Copy-Some is a single drive file copier written mostly in BASIC. 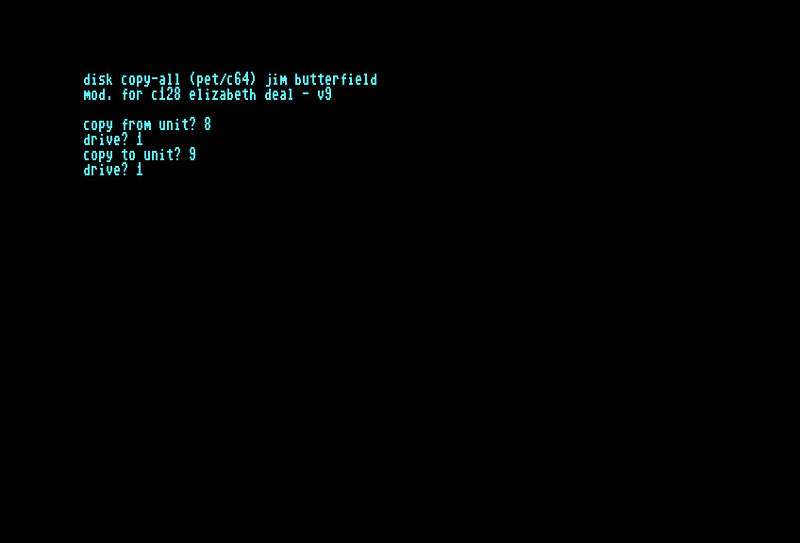 Copy-All 128 is a modified version of Jim Butterfields Copy-All 64/Pet. Although I'm sure Elizabeth Deal had best intentions in mind when modifying this for the 128, it unfortunately is very buggy and I don't think I'd trust it to do my file copying. Double File Hackem by the famous Basement Boys is a two drive file copier. This particular version is supposedly bug free by modification from Masoko. 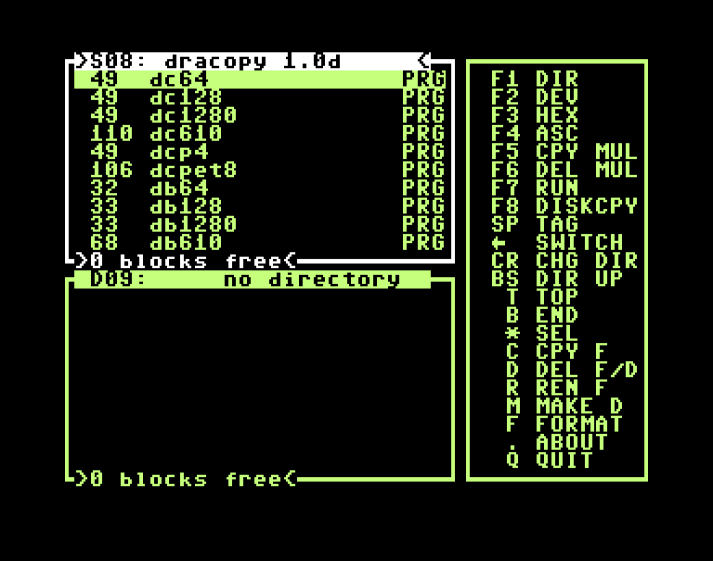 DraBrowse and DraCopy, both merged into a single program. File copy/move between directories within the same drive or disk image. File copy/move between directories and disk images within the same drive (REU expansion memory required). Detects and pass only through the connected drives. Added file copy support for SEQ and REL files. 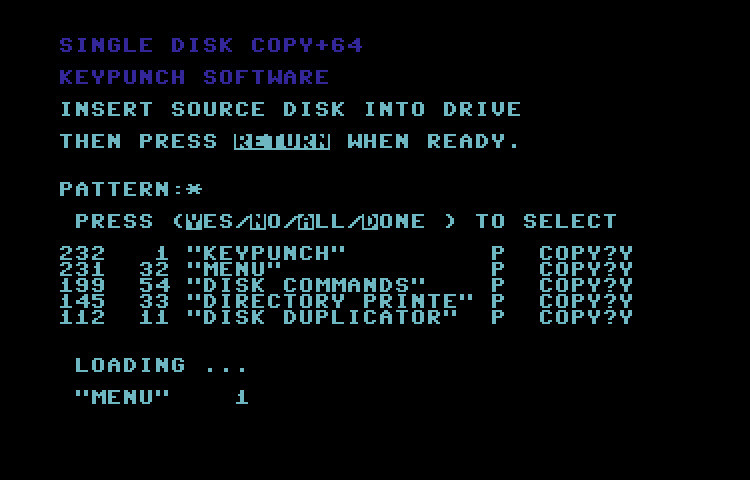 Added disk copy support for 1571 and 1581 drives, and D71 and d81 disk images. 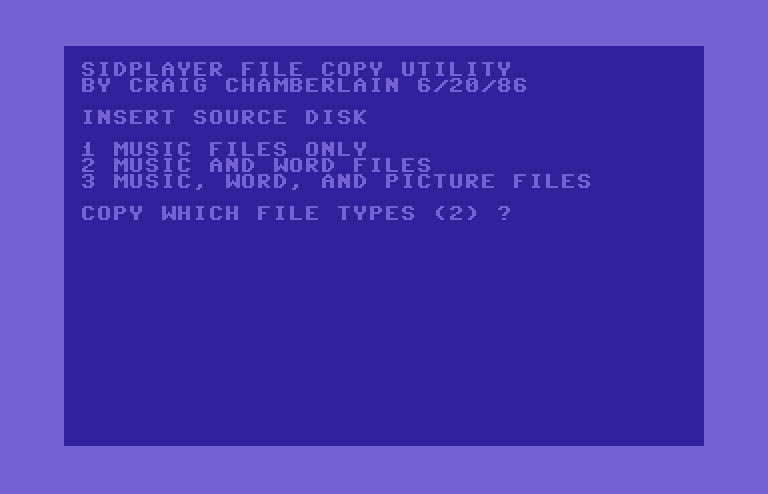 Removed the old screen disk copy progress because of the lack of screen space for bigger disk types, but added the copy error report when the copy is finished. Added make disk image for d64, d71 and d81. Improved copy command (Copy and Copy Selected under the same option). Improved delete command (Delete and Delete Selected under the same option). Added the dos status drive information. Added a new custom prompt text input in the status bar. Shows all the messages in the status bar. Improved asc text and hex viewers. 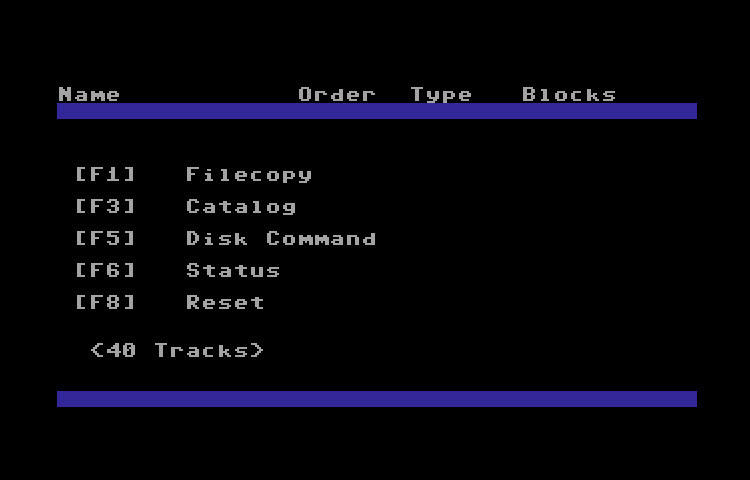 Added path support for winvice (dos filesystem) and everything works except the cd (change directory) to the disk images. Versions for C128 and C64. The only difference is the fast mode used by the C128 in 80 column mode. Like the old releases only uses kernal routines and should work on any iec or cmd devices. The filecopy between directories have a little problem. The program must go to the disk parent directory always when starts. 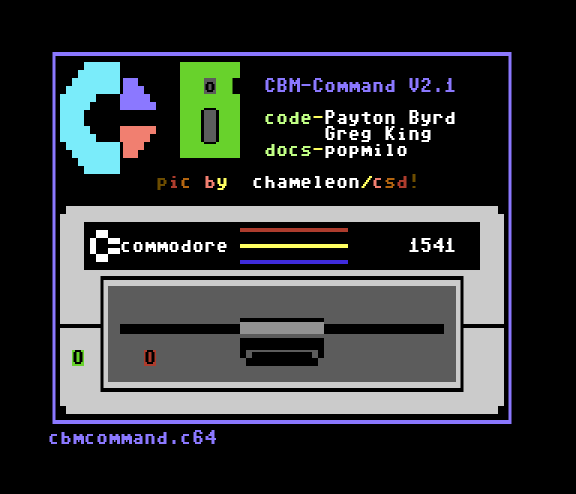 This is absolutely necessary because of the path counter and there is no other choice.There is attached the c64, c128 programs and sources. I hope you find it useful. Many thanks to Draco for sharing ! 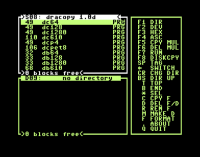 DraCopy is a simple copy program and DraBrowse is a simple file browser. Both programs use kernel routines, so they should work with most date-oriented IEC devices, such as the SD2IEC. On CMD-compliant devices, directories are supported. The programs have emerged from their own needs and therefore do not pose any special requirements to implement existing software or to implement unprecedented features. 1: 1 disk copy added. This function is called with the key combination F8. It is copied from the selected drive to the other drive. If a MMC2IEC with at least firmware sd2iec 0.8.x is connected as the source drive, then D64 images can be written to disk by switching to the image with the return key on the source drive (MMC2IEC) and then copying it to the target drive with F8. Attention, without an accelerator, copying an entire disk or writing an image takes up to an hour. With Accelerator it is correspondingly faster, eg about 7 minutes with Jiffydos. This is version 1 of the Duplicator - It's a decent file copier, but I'm really curious about the <40 Tracks> blurb on the main screen. By Bartje. Duplicator III is a nice file copier. Nothing particularly special about this copier, but it is simple and easy to use. 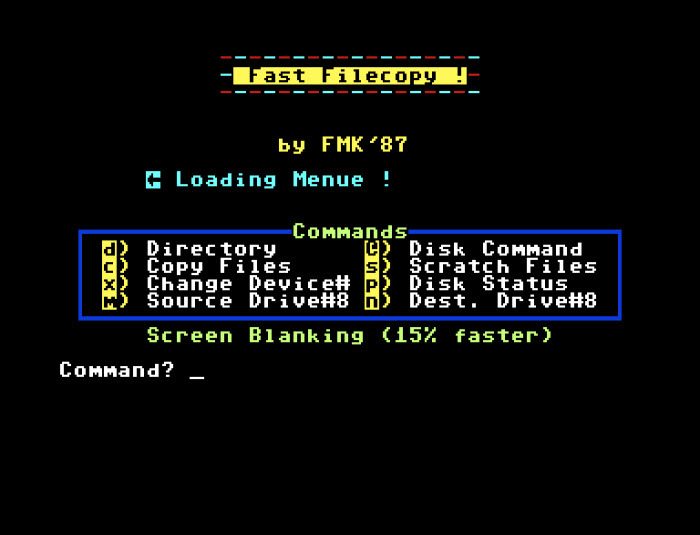 Fast Filecopy by FMK released in 1987. Supports dual drives and device # changing. Released by Tango Soft Systems. File copier isn't the most imaginative name, but I suppose it does what it says and a little more. 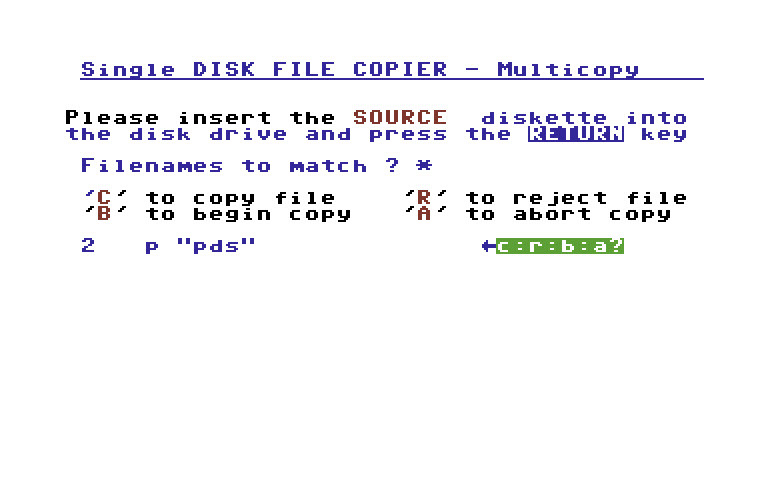 File Copy v2 by MPS Software. With a nice file selector interface, this is a nice file copier. 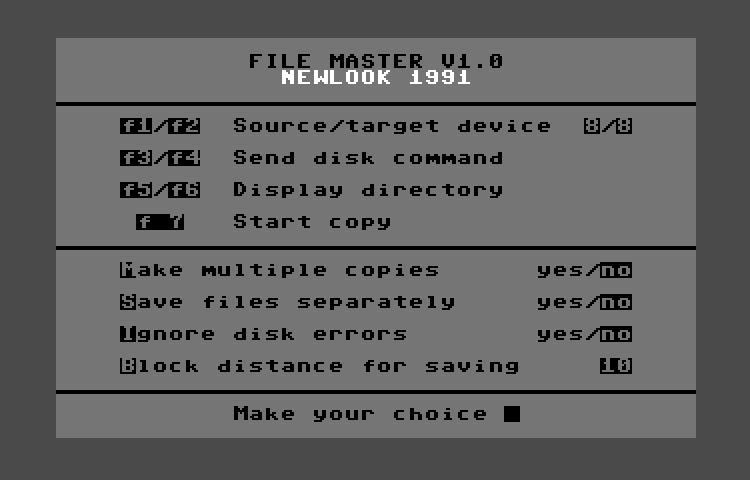 Released in 1991 by Newlook, File Master is a respectable file copier for single or multiple drives. A couple features that stand out are the ability to make multiple copies of a file and to ignore disk errors. There is also a Block distance feature that I am curious about but haven't played with. 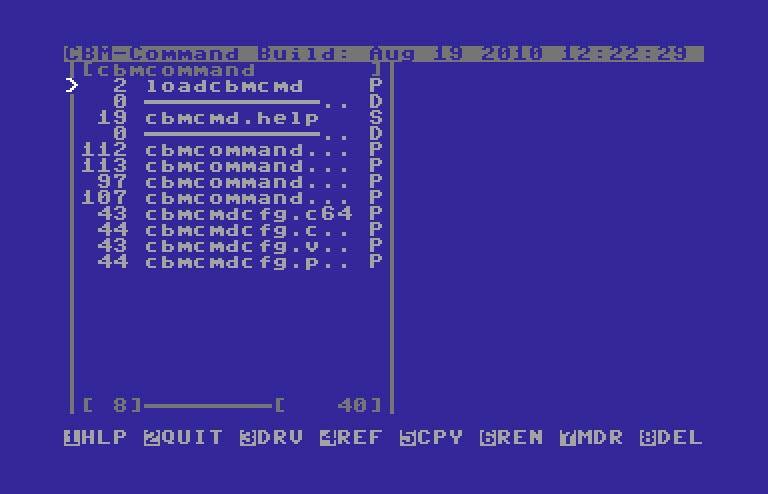 Broken by Softdaeler (Seriously, that's how he spelled his name) - File Master reminds me of a CMD copy program but I don't recall its name atm. Anyway, this looks like a nice copier with an option for Block Distancing I haven't seen before. This particular version is a little smaller than the one released by Newlook so I'm guessing the difference is just the BASIC compiler used. 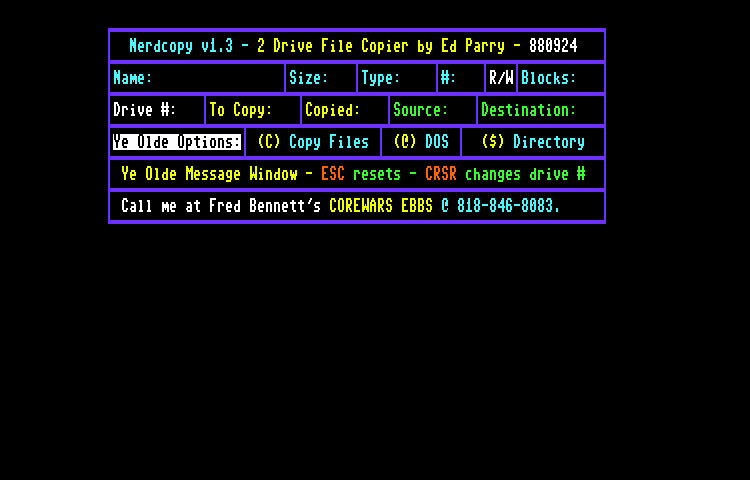 Released on March 1st, 1987 by Ed Parry - Nerdcopy is a 2 drive file copier. 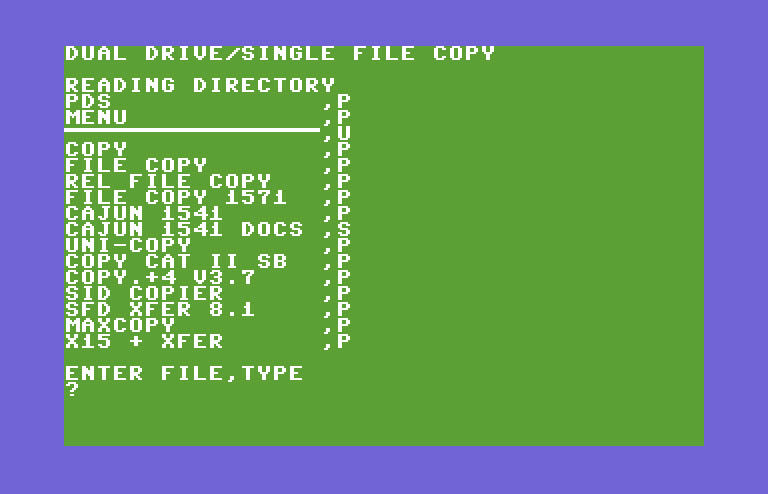 Nerdcopy by Ed Parry is a 2 drive file copier for the C128 in 80column mode. PuterTechn's File Copy is a multi file copier that supports the 1541, 1571 and 1581. It also supports partitions on the 1581. SFD 1001 Copier is a file copier designed primarily for the SFD1001 floppy drive and the IEEE488 interface. 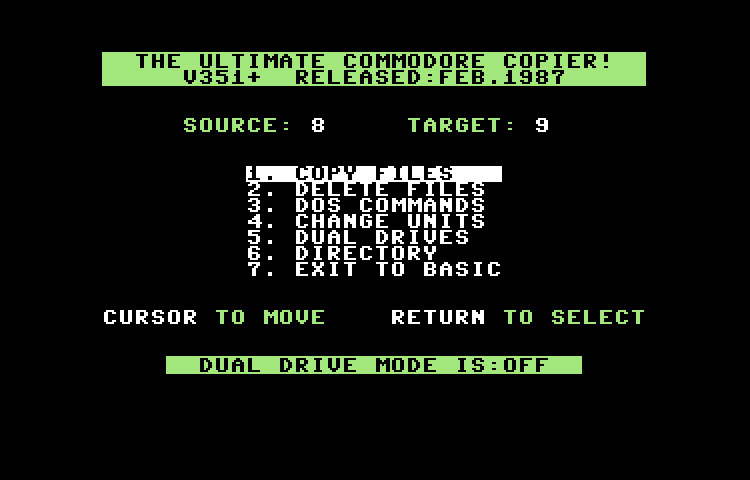 This updated version released in February 1987 supports dual drives. Original concept: Jim Butterfield, Mods by Winston O'Boogie. This program was written primarily for work with the SFD-1001 and IEEE-488 interface. However it should copy or scratch any size or type of file from any disk drive. Sidplayer file copy utility by Craig Chamberlin can copy music files, music files with words and music files with words and pictures. Single Disk Copy+ is another utility from the Keypunch Software utility pak that allows you to multi file copy with a single disk drive. Released in 1983 by St. Buehne and the International Spreading Service. Always handy to have a single drive file copier. Not too much special about this program, but it's nice to be able to copy files with only a single drive.